Brand-new high-tech maintenance robot. Can create oil that works on any kind of machine and shoot it from his arm! Most of OilMan's fighting requires you to do a lot of jumping, so be prepared for your thumb to do a lot of quick button-pressing. Get in the middle of the room and shoot Oilman. Do little bunny hops over his Oil Glop attacks, then move into either far half of the room. 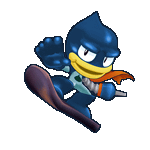 Oilman will most likely wind up standing where you just were either by running or jumping. Get past Oilman by running under him if he jumps, or jumping over him if he runs! Return back to the center of the room and repeat the process. If you do this care-fully enough, all the Oil Glops that accumulate on the floor won't affect your fight at all! If you happen to have Fire Storm, use it. It clears up the blobs and makes for an easier fight. Lastly, OilMan's Oil Slider can be a pain, but as long as you time your jumps and get used to which-taunt comes before which attack - you'll be fine.